The skid control ECU judges brake failure conditions have occurred based on the signal from the brake pedal load sensing switch and master cylinder pressure sensor. Do not intentionally stop the engine when driving. Even when no malfunction has occurred in the brake system, DTC C1441 will be stored when it is judged that a failure has occurred in the brake system due to a reduction in vacuum. The brake pedal load sensing switch is malfunctioning (deviation in characteristics). The brake pedal is depressed when moving the vehicle with the engine not running and the ignition switch to ON. Bleeding is performed with the engine running or the ignition switch to ON. *: The skid control ECU may store this DTC upon judging that a stuck on malfunction has occurred when the accelerator pedal and brake pedal are depressed simultaneously. However, this does not indicate a malfunction. When the brake pedal load sensing switch and master cylinder pressure sensor are functioning normally and the stop light switch and brake pedal load sensing switch are judged as on, the pressure signal from the master cylinder pressure sensor does not indicate an increase. (a) Interview the customer to check if the pedals were depressed simultaneously while driving or braking. The pedals were not depressed simultaneously. The skid control ECU may store this DTC upon judging that a stuck on malfunction has occurred when the accelerator pedal and brake pedal are depressed simultaneously. If the pedals were depressed simultaneously, clear the DTC because it is not a malfunction. Read Freeze Frame Data at the time DTC C1441 was stored, go to operation history and confirm the operating conditions. When reading Freeze Frame Data to confirm operating conditions, the following items can be confirmed: "F# or R# Wheel Speed", "Vehicle Speed", "Real Engine Torque" and "Accelerator Opening Angle %". (a) Based on the customer problem analysis, confirm the brake pedal condition at the time the brake pedal was operated. The brake pedal is hard to depress. The brake pedal is extremely easy to depress. (a) Check the brake booster assembly (See page ). The brake booster assembly is abnormal. The brake booster assembly is normal. If the result shows that the brake booster assembly is defective, check the related components such as the brake booster, brake vacuum check valve, check valve grommet, brake booster gasket, vacuum hose and intake system for vacuum leaks or clogs. (1) Perform a visual inspection and operate the brake pedal to check for any malfunctions. (2) Check the brake pedal height, brake pedal free play and brake pedal reserve distance. If the brake pedal height is not within specification, confirm that there are no other malfunctions before adjusting the brake pedal height. (1) Check that the disc brake pads of each wheel are installed correctly. (2) Check that the bleeder plug and union bolt is not loose, and that there are no damaged gaskets or brake fluid leaks, for each wheel cylinder. 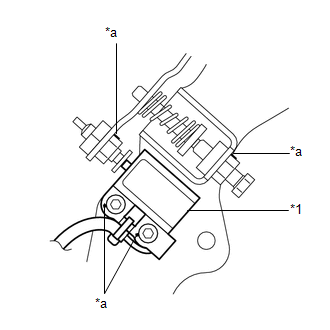 (1) Check and take a note of the fluid level in the brake master cylinder reservoir assembly. (2) Repeatedly depress the brake pedal and confirm that the brake pedal feels normal (no air in the system, etc.). (3) Check if the brake fluid level in the brake master cylinder reservoir assembly has changed. (4) If the brake fluid level has decreased, check for leaks due to damaged brake lines or hoses, loose union nuts, damaged brake master cylinder sub-assembly seals, etc. (1) Bleed air from the brake lines and brake actuator assembly. (c) Select the Active Test on the Techstream. (d) Fully depress and hold the brake pedal. Make sure that the brake pedal has travelled excessively before holding it depressed. (e) Operate the ABS motor relay using the Active Test and check if the brake pedal height changes when the pump motor is operating. The brake pedal height does not change (the brake pedal travel remains excessive). (a) Check that there are no brake fluid leaks and no indications of a malfunction in the brake master cylinder sub-assembly. There are no brake fluid leaks and no indications of a malfunction in the brake master cylinder sub-assembly. (a) Inspect operation of the brake booster assembly. (c) Perform a road test. Do not intentionally stop the engine when driving. DTC C1441 will be stored if the brake pedal is depressed when moving the vehicle with the engine not running and the ignition switch to ON. DTC C1441 is not output. DTCs C1441 and other DTC are output. Only DTC C1441 is output. If DTC C1441 and other DTCs are output simultaneously, the other DTCs may have caused the engine to malfunction, resulting in DTC C1441 to be output. Read Freeze Frame Data to confirm malfunctioning parts and repair the applicable part. When reading Freeze Frame Data to confirm malfunctioning parts, the following items can be confirmed: "F# or R# Wheel Speed", "Vehicle Speed", "Real Engine Torque" and "Accelerator Opening Angle %". (a) Check that the match marks on the adjustment part of the brake pedal load sensing switch are aligned with the match marks on the bracket, nut, adjusting screw, etc. The match marks on the adjustment part of the brake pedal load sensing switch are aligned with the match marks on the bracket, nut, adjusting screw, etc.